Sorge is a legend in intelligence history. More than 100 books have been written about him...This latest, by Owen Matthews, a journalist and author of Stalin’s Children, is undoubtedly the best: detailed, wry, sympathetic and occasionally oddly moving. An Impeccable Spy is the first to be written with access to Russian intelligence files, and finally breaks open the enigma of the man described by John le Carré as 'the spy to end all spies' ... This is a superb biography, alive to Sorge’s human flaws as much as his professional competence, and with a salutary vein of anger running through it. Owen Matthews has tremendous fun with Sorge’s life, which is so packed with incident as to be barely credible ... The final chapter of this magnificently written book dramatically highlights the contrast between the lofty professed ideals of the Soviet Union and its squalid reality, along with the sad fates of those people unwise enough to trust the communist state with their lives ... packed with humour and insight and all served up with a rare lightness of touch. Ben Macintyre and John le Carré fans alike will find themselves very much at home. Sorge’s dramatic story is well-known. Several biographies have been written; a film was made in France. Owen Matthews, though, is the first to use newly available sources in the former USSR, including KGB archives. It is a vividly told story, thoroughly researched and well-crafted ... I love a thrilling spy story, especially one as superbly narrated as this, full of Bond-like drama about Sorge’s brushes with death, his love of fast cars and women. But there’s a flaw common to many true espionage tales. The cold war and its fictions created an exaggerated idea of spooks as 'masterminds' that has been exported into real life ... Ian Fleming called Sorge 'the most formidable spy in history'; John le Carré thought him 'impeccable'. But was he? In the big picture he failed. Matthews is good at explaining why. The Germans invaded and more than 20m Russians died in the war. However brilliant and fascinating, Sorge couldn’t find a way to prevent it ... a highly relevant book for today. 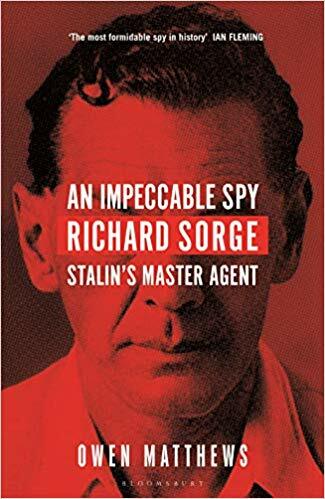 What did you think of An Impeccable Spy: Richard Sorge, Stalin's Master Agent?